Zebra Chalet offers affordable accommodation in the Cederberg within the lauded Cedar Rock reserve. What is now a comfortable stone chalet was formally a shepherd’s cottage which has been restored beyond its former glory without any significant new alterations which could detract from the experience. 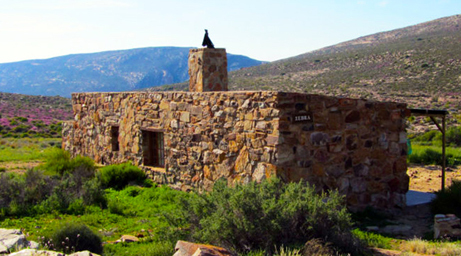 Cederberg Chalets is dedicated to the preservation and rehabilitation of the area and, as such, prides itself on the natural theme of its cottages. Zebra has two bedrooms with four beds in total, which makes it ideal for the small family unit or a small group of close friends. This chalet is in close proximity to gemsbok cottage, which makes the two of them the best selections for a larger group of visiting friends – as it takes but a few moments to reach one another’s porches for a quiet drink. Complete with free roaming Cape mountain zebra, gemsbok, springbok and other wildlife, the chalet offers full access to all of the attractions inherent to the Cederberg and provides a great level of comfort after a strenuous day of exploration.